The ability to create rapport with people is a fundamental skill in sales, management, personal relationships, and everyday life. The goal of the DISC® is to help you create personal chemistry and productive relationships. You do not have to change your personality; you simply have to understand what drives people and recognize your options for effectively dealing with them. DISC® teaches you powerful life skills that will serve you well in all your relationships: business, social and family. The DISC® online assessment is a resource for individuals and organizations desiring to improve performance, increase productivity and to positively persuade other people. Unlike many other behavioral assessments, our reports are as much prescriptive as they are descriptive! In other words, we spend as much time teaching you how to improve your own productivity and interpersonal interactions as we do describing your natural DISC® behavioral style. We realize that you are about to invest money and time in our online assessment, so we want you to come away with fast, effective learning strategies that get you results immediately. 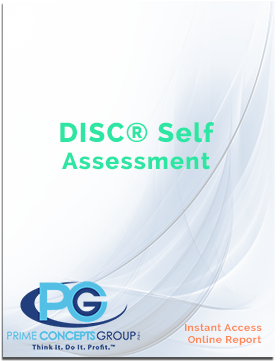 The DISC® Assessment is valuable for individuals and all types of organizations: public or private; large or small. Change Management – DISC® teaches behaviors for transforming resistance into receptivity. Coaching – Discover how to use the DISC® to help others reach their real potential consistently! Conflict Resolution – See how to use the DISC® to magically dissipate tension and mistrust! Customer Service – Use the DISC® to show how one can determine how to exceed expectations. Hiring – Learn how to train others to use the DISC® to find the right fit the first time around! Leadership Programs – You’ll be amazed yourself how you can truly empower using the DISC®! Team-building – Learn how to masterfully transform a dysfunctional team with the DISC®!